The Basketball Bundesliga (BBL) (English language: Federal Basketball League), for sponsorship reasons named easyCredit BBL, is the highest level league of professional club basketball in Germany. The league comprises 18 teams. A BBL season is split into a league stage and a playoff stage. At the end of the league stage, the top eight teams qualify for the playoff stage, and the teams positioned in the 17th and 18th places are relegated to a lower tier league. The playoffs are played in a "Best of five" format. The winning team of the final round are crowned the German Champions of that season. In addition to the league competition, all BBL teams compete for the German Cup (BBL-Cup). Teams playing in the second league (ProA or ProB), or in a lower level Regionalliga, are also eligible to participate in the German Cup. There are always 3 knock-out rounds that are played for the BBL-Cup. If more teams from the leagues below the BBL level apply for participation, then available places, and additional qualification rounds are added for them. The final four remaining teams determine the rankings for bronze, silver, and gold medals, in knock-out matches that are termed the BBL-TOP4. The gold winning team is the German Cup winner. The Basketball Bundesliga is run by the Basketball Bundesliga GmbH. 74% of BBL GmbH is owned by the AG BBL e.V. (which is composed of the clubs), and 26% by the German Basketball Federation (DBB). In Germany, a national domestic basketball championship was first organised in 1939, and it was won by LSV Spandau. By 1944, almost all basketball activity in the country was forced to an end, due to the Second World War. In 1947, MTSV Schwabing München became the first champion of post-war divided Germany. 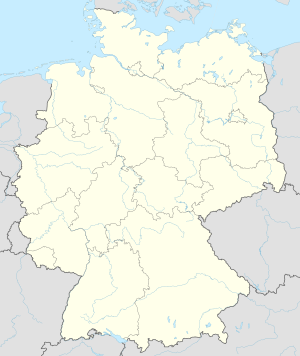 The creation of a split West-German federal-league, consisting of one northern division and one southern division, each comprising 10 teams, was decided on by the German Basketball Federation (DBB) in 1964. On October 1, 1966, the first season of the so-called Basketball Bundesliga started. Starting with the 1971–72 season, the size of each division was reduced to 8 teams. With the 1975–76 season, the league structure was changed into a ten team first league (1. Basketball Bundesliga), and a 20 team second league (2. Basketball Bundesliga). Only the second league was split into a northern and a southern division, of 10 teams each. In 1985, the top league was enlarged to a size of 12 teams, and two years later, each division of the second league was also enlarged to 12 teams. In 1988, the championship mode "Best of five" was applied for the first time. Starting with the 1995–96 season, the first league consisted of 14 teams. The Basketball Bundesliga GmbH (BBL) was founded in October 1996. The federal leagues received their own administration within the framework of the German Basketball Federation in 1997. Since then, the second league divisions have been administered by the "AG 2. Bundesliga", while the BBL has been responsible for the first league. Two years later, a contract was signed between the BBL and the German Basketball Federation, in which the federation transferred its marketing/events rights to the BBL, for a 10-year duration, and in return, the BBL agreed to pay an annual "amateur support fee" of DM 600,000 (€ 306,775). Starting with the 2003–04 season, the top league was increased to 16 teams, and in 2006–07, it was further increased to its present size of 18 teams. For the following 2007–08 season, the structure of the second league was reshaped from its northern/southern divisions, into a ProA division, and a ProB division. These divisions remained under the administration by "AG 2. Bundesliga". Between 1994 and 2001, the highest level German basketball league was called "Veltins Basketball Bundesliga", and from 2001, until 2003, the league was known as "s.Oliver Basketball Bundesliga". Bayer Giants Leverkusen hold the league titles won record, being the winner of 14 German Basketball Championships. However, since 1997, ALBA Berlin has dominated the league, winning their 8th title in 2008. Twenty-one teams have won the championship, since its inception. In 2016, the BBL joined forces with Tipbet, a Malta-based betting company. This made Tipbet the Official Betting and Premium Sponsor of the league; the sponsorship agreement results in advertising activities throughout the arenas and online, and runs until 2018. Currently, all Bundesliga clubs must play in arenas that seat at least 3,000 people. Player nationality by national team. ^ "BBL partners with Tipbet". SportsPro. SportsPro. Retrieved 6 December 2016. ^ "Tipbet.com is The Official Betting and Premium Sponsor of the German easyCredit Basketball Bundesliga". Tipbet. This page was last edited on 7 February 2019, at 21:25 (UTC).